I feel like the luckiest girl in the world this morning. Wake up at 7.30 in our rented holiday apartment in the Upper East side – Manhattan, jumped into a taxi to Hartsdale to get to Tao Porchon Lynch Yoga Class. Meeting her and practicing together was a dream that came true. 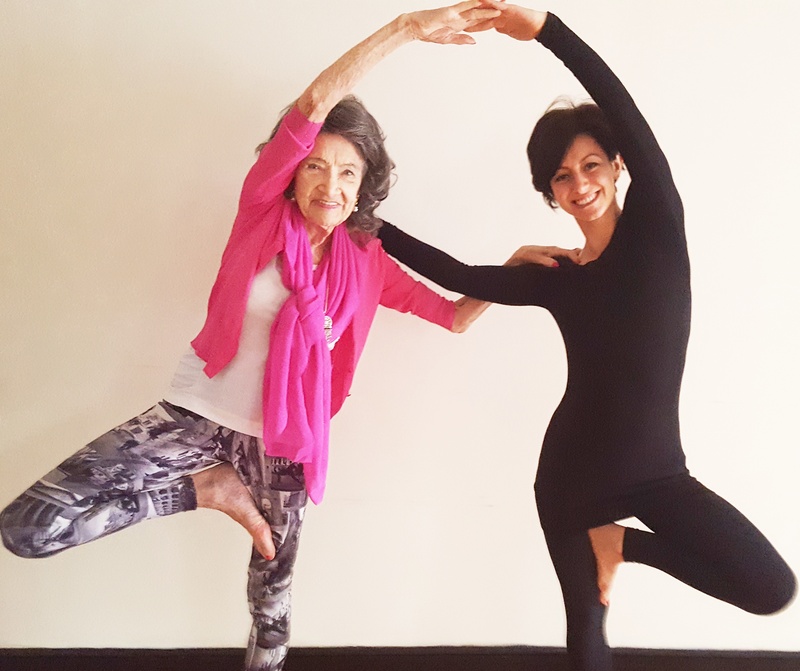 I wanted to meet this incredible 97 year old yoga teacher since the day I heard about her. And today was the day I got to meet her for real. I arrived at the Fred Astaire studio early for the class and just as I hopped out of the taxi I saw Tao parking her car and walking towards the studio. High heels, make up done and yoga pants on. What else would you expect from someone turning 98 in just a few months? I was welcomed by Tao and Suzanne, a student who practiced with Tao for the past 16 years and now covers her classes when Tao is around the world teaching. I felt a sense of community immediately. We had 20 minutes together before class started and I got to chat to these 2 beautiful ladies and take a few pictures. That sense of community carried on throughout the class, some got out of poses to help other students, somebody offered to take a picture of me in one of the poses. We all supported each other and laughed. Tao did most of the asanas with us. Despite a recent injury that kept her out of the studio for a few weeks. She says she is still a little shaky, but to me she just seemed absolutely incredible. At the end of the class I went to thank her and she said: “Gandha, you are more than welcome, you are going to be a sensational yoga teacher“. Well I hope to live up to that expectation. Certainly I hope to get to 98 and be as sensational as she still is. What a great opportunity I had, what a lucky day.